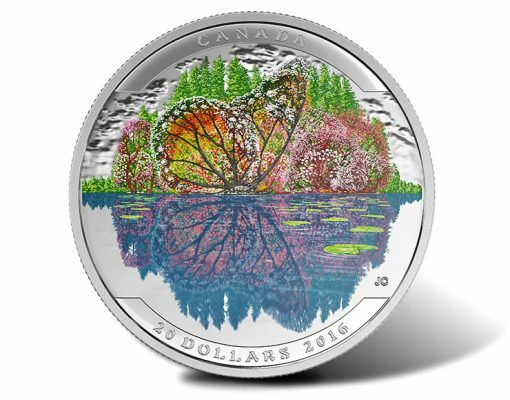 Optical illusions emerge from Canadian landscapes on five 2016 coins from the Royal Canadian Mint. Each offers an image of a Canadian landscape and combines natural elements to create an optical illusion of wildlife. The 2016 $20 Butterfly Silver Coin depicts flowering dogwood and black plum trees rising above the calm waters of a lake. When looking closer at the design, however, a butterfly emerges. One of the butterfly’s wings lies outstretched among the branches while the other appears as a reflection in the water. Nearby, a northern map turtle lingers and presents the illusion of the butterfly’s body and eye. Canadian artist Julius T. Csotonyi designed the scene. Reverse inscriptions include CANADA, the coin’s legal tender face values of 20 DOLLARS, the year 2016, and the artist’s initials, JC. Susanna Blunt’s effigy of the Queen is on each obverse (heads side) with inscriptions of ELIZABETH II and D G REGINA. Pricing for the 2016 $20 Butterfly Silver Coin is CAD $99.95, or about US $77. 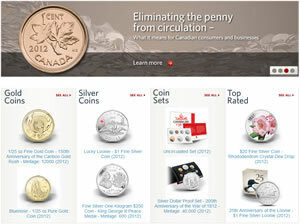 It or the subscription is available directly from the Royal Canadian Mint at mint.ca. 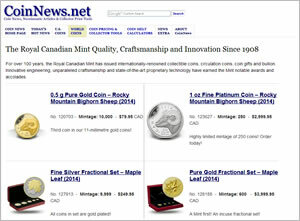 Here are affiliate links to the Mint’s Butterfly coin and the 5-coin subscription . The RCM Master’s Club 2016 exclusive coin #3 that I received yesterday sold out of the 4,000 very low mintage quickly. It is a $20 1-oz fine silver coin with polar bear & cub with blue enamel iceberg & water. Beautiful coin! I thought I have read in past blog posts that you did not like these colored coins? I like the quality of the RCM coins, (don’t get me wrong) but I rarely ever buy any because the cost is so out of this world. I have a couple of RCM colorized coins and I found I did not like them as they seem to have a silk screened look to them. You are right. I have never bought a colorized coin before from any Mint. But when I was offered this new polar bear coin by RCM I liked the design & light blue enamel color which their technical people explained was perfected over similar past issues. The color is only at the very bottom of the design. Plus it is the lowest mintage silver 1-oz coin they have issued in awhile & for club members only. It was $88 US & I actually love it! But I doubt it will change my mind too much as far as future purchases go.